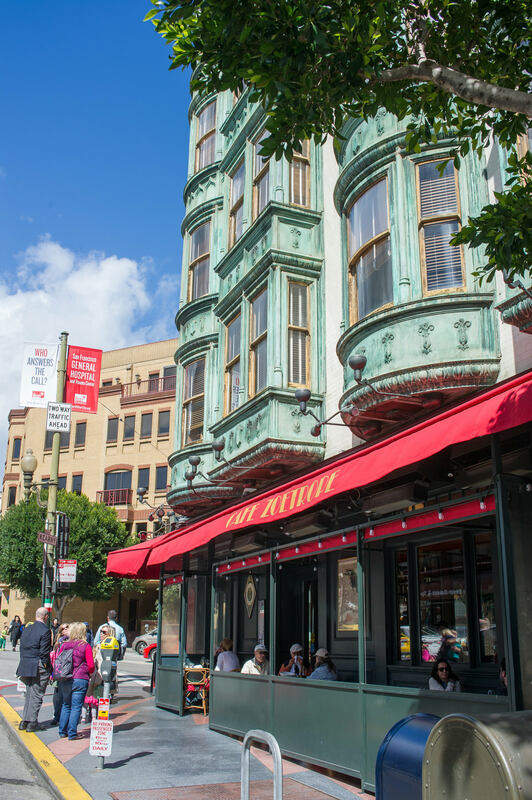 Named for Francis Coppola's venerable production company, American Zoetrope, Cafe Zoetrope is located in the majestic Sentinel Building, a San Francisco historic landmark in the heart of North Beach. We are a European-style cafe and offer authentic Italian cuisine and a wide selection of Italian and California wines, including our premium offerings that we carry exclusively at our wineries, cafes and website. 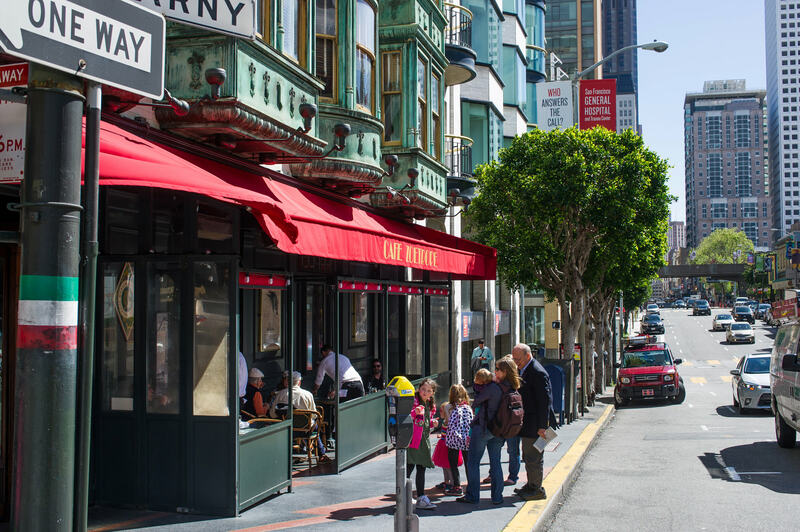 One-of-a-kind mementos spanning Francis' long and celebrated film career decorate the walls while the awnings and heated sidewalks make it comfortable to dine outside even in foggy San Francisco weather. Cafe Zoetrope is located in the historic Sentinel Building on the corner of Kearny and Columbus. 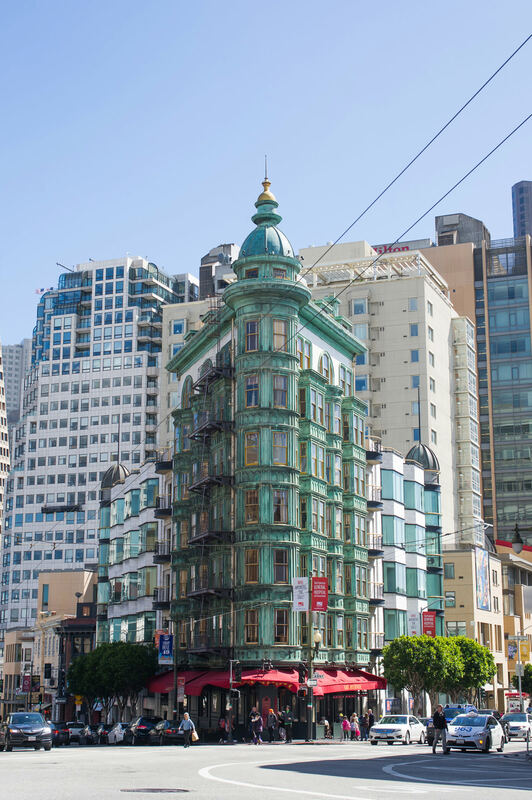 One of the most photogenic and recognizable structures in North Beach, the Sentinel Building is lush with history. In 1906 construction began on this wedge-shaped, flatiron building. The building was still a skeleton when the 1906 earthquake hit, yet miraculously it survived and was completed in 1907. Abe Ruef was a notorious political boss and lawyer in San Francisco in the early 1900s. He gained notoriety as the corrupt political boss behind the administration of Mayor Eugene Schmitz of San Francisco during the period before and after the 1906 San Francisco earthquake. Ruef's political machine gradually gained control of the Chief of Police, the Board of Supervisors, and several judges. A Federal investigation into corruption at City Hall indicted Ruef and at the time of his trial, Ruef occupied offices in the Sentinel Building. The ground floor was originally the access point to a very popular underground restaurant, Caesar’s Grill, which claims to be the birthplace of the Caesar salad. This restaurant was closed down during Prohibition for violating anti-alcohol laws. After Caesar’s closed, a covert but popular speakeasy called Neptune’s Grotto was run out of the basement. During the Great Depression of the 1930’s the building began to decline in form and appearance. The Bohemian movement began to take up shop in the building. Businessmen and corporate and law dealings were replaced by writers and artists who often lived and worked in the building. In 1949 North Beach local Eric “Big Daddy” Nord sowed the seeds for a nightclub that would reach great fame, starting the hungry i nightclub in the space that Caesar’s had been in. Seeing the club’s potential, Enrico Banducci bought the club from Nord in 1951 with $800 he had borrowed from a friend. It flourished here until 1953 when they were evicted by the fire marshal and moved over to their more famous digs on Jackson Street. Although the basement was having a musical heyday, the overall building was in dismal shape. In 1958 a Dutch businessman, Robert Moor, purchased the building as an investment at the urging of his architect, Henry Bull, who did not want to see the deteriorating building be torn down. Bull did extensive renovations on the building and a year and a half later it was sold to the Kingston Trio. They renamed it Columbus Tower and turned the basement into a recording studio where they recorded much of their work. Many other musicians and musical groups were allowed to utilize this studio, including the Grateful Dead. Francis Ford Coppola bought the building in 1972 to be the headquarters for his production company, American Zoetrope. A number of his films including the Godfather II and III, Apocalypse Now, The Conversation, One From The Heart, The Outsiders, and Dracula were written, edited, or sound mixed within these walls. Cafe Zoetrope, opened in 1999, was created with much thought from Coppola. Many of the items on the menu are his own recipes and the European ambience is something he cultivated. The Cafe functions as a wine bar and a restaurant in the style of a Roman Trattoria.